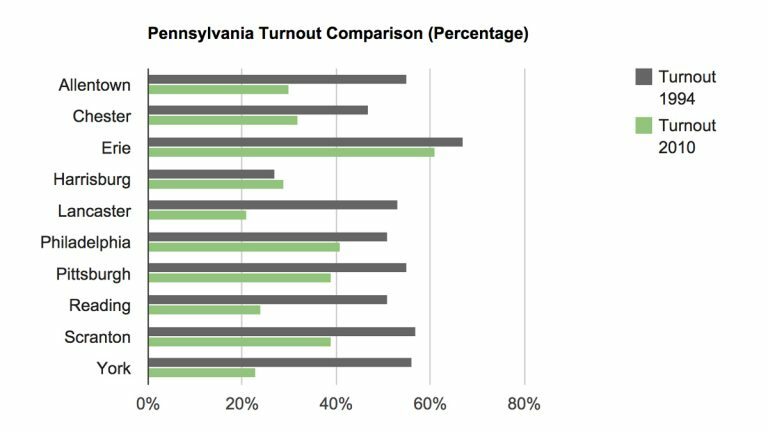 Voter turnout has dropped 12 percentage points in Pennsylvania over the last five gubernatorial elections, and even more so in most of the Commonwealth’s urban centers, according to Keystone Crossroads’ analysis of Department of State data. One might expect the decline to stem at least in part from decreased voter registration and a drop in the adult population. Voter registration increased statewide by 45 percent; the voting-age population, by 9 percent. While most cities also increased registration, they lost voting-age residents. The voting-age population fell in most of the cities and other distressed communities examined by Keystone Crossroads, most drastically in Braddock, Allegheny County, which in 2010 had half as many voting age residents as two decades prior. Allentown, Bethlehem and a handful of other cities added adult residents, each by less than 10 percent. Although most of the Commonwealth’s distressed cities had fewer residents eligible to vote, more of those remaining registered. Hazleton (down 12 percent), Johnstown (4 percent), Clairton (2 percent), and Harrisburg, (9 percent) as well as the tiny Allegheny County communities of Homestead (27 percent) and Rankin (30 percent). 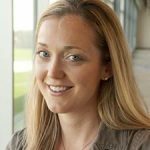 It increased in the others, more than doubling in sparsely populated Westfall Township and Millbourne borough.That failed to translate to stronger turnouts, however. Turnout increased only in Harrisburg, despite the capital city losing voting-age residents and registered voters. Experts attributed that to enhanced public engagement one might expect in the state capital, although the city’s turnout remains low (compared to other cities) despite its trend-defying rise in 2010 and status as a government center for more than 200 years. Total mid-term turnout is expected to continue to dwindle this year.